Proverbs 19:20 (NIV) - Listen to advice and accept discipline, and at the end you will be counted among the wise. Taking Care of Me: Where are my knees? 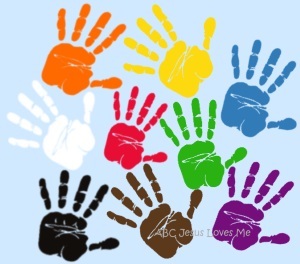 - ABC Book: Use blue watercolor to paint the Jesus worksheet. For the next 11 weeks, the child will be creating a Handprint Wall. Each week create the colored handprint (this week is blue) by painting the child's hand (or foot) and stamping it onto a piece of white paper. Write the name of the color on the handprint. Display it at the child's level to point and discuss the colors. Coffee-Filter Shapes - Using a washable blue marker, draw a thick-lined circle on a coffee filter. Spray water on the filter which will cause the ink to bleed. Let dry. - Pinch a cotton ball in a clothes pin. Assist the child in dipping the cotton ball into blue paint to stamp circles on the Jellyfish worksheet. - If possible, visit a local aquarium to see jellyfish or view on YouTube. - Look for items in the book that are circular in shape. Removing and adding stickers to a paper is a great fine motor activity. For only a few dollars, a multitude of sticker books are available. Assist the child in removing the sticker and allow him to place it on another page. This is a wonderful quiet activity for restaurants, church, and other activities. Ribbon Dance - Attach ribbons, streamers, or scarves to the end of a paper towel holder or straw. Hold the ribbon swirling it from side to side, up and down, etc. Be sure to switch hands. This activity improves hand-eye coordination.